Scrum-half Ali Price has targeted a breakthrough into the senior Scotland squad after being awarded a two-year contract extension by Glasgow Warriors. The 22-year-old Under-20 cap has impressed this season and made five starts, including last month’s 22-5 win over Racing 92 at Kilmarnock in the European Champions Cup. The Kings Lynn-born former Bedford Blues player arrived at Scotstoun in the 2013-14 season and has progressed through the academy system and, after being awarded short-term professional terms in December, he now has the security of a contract until May 2018. The youngster doesn’t hesitate when asked about his career goals. The example of fellow 22-year-old scrum-half Sam Hidalgo-Clyne along the road at Edinburgh shows that the leap from the pro-team to Test arena can sometimes be swifter than you’d expect. Hidalgo-Clyne went from being a few rungs down the pecking order at the capital side to an international player in the space of a few months. Last summer Price could have been forgiven for thinking his opportunities this season might be rare as the Warriors boast a scrum-half stable that also includes World Cup vice-captain Henry Pyrgos, British and Irish Lion Mike Blair and Test cap Grayson Hart. However, a combination of injuries and his own good form has seen him thrown in by head coach Gregor Townsend. Price qualifies for Scotland through his Edinburgh-born mother Carol and, with grandparents in Troon and more relatives near Irvine. Opting to pursue his Scottish nationality is something he dedicates to his mum. The most pressing priority for Price and his team-mates will be attempting to resurrect their push for the play-offs following last weekend’s tight 13-10 loss at Ulster. 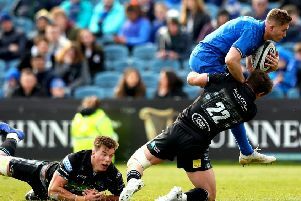 The reigning Guinness Pro12 champions are down in eighth with a couple of games in hand and know they need to start stringing a few wins together.